Renewable energy legislation such as the EU Renewable Energy Directive (RED) aims to significantly scale up forms of energy classed as renewable, with the stated aim of reducing greenhouse gas emissions. There has been a lack of critical debate about the definition of renewable energy to date. According to the International Energy Agency, renewable energy is "energy derived from natural processes (e.g. sunlight and wind) that are replenished at a faster rate than they are consumed". Large-scale industrial bioenergy does not meet this definition because it relies on a major expansion of industrial agriculture, monoculture tree plantations, and industrial logging, which deplete and pollute soils and water, destroy natural ecosystems and biodiversity, and destroy the livelihoods of many millions of people, particularly in the global South. Furthermore, large-scale industrial bioenergy cannot meet the EU’s stated aim of reducing emissions of greenhouse gases (GHG) because it leads to emissions of carbon and other greenhouse gases that are commonly greater than those from the use of fossil fuels. Nevertheless, within the EU's overall renewable energy target, bioenergy competes with more sustainable and climate-friendly renewable energy rather than with fossil fuels. 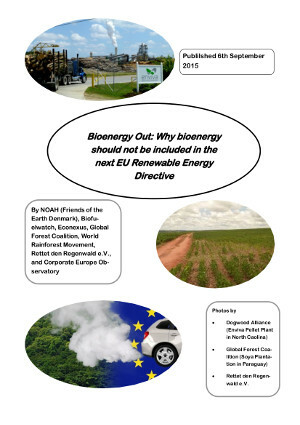 This briefing makes the case for taking bioenergy out the new EU Renewable Energy Directive for 2020-230.